Photo Caption A: Models present a historical overview of style at the Paterson Museum’s eco-friendly fashion art installation, Paterson Eco-Chic, on September 17, 2017, during a fashion show orchestrated by the Berkeley College Fashion Club of Berkeley College in Woodland Park, NJ. Students from the Berkeley College Fashion Club in Woodland Park, NJ, helped the Paterson Museum launched its eco-friendly fashion art installation, Paterson Eco-Chic, on September 17, 2017. The exhibit displays garments made with recyclable materials donated by manufacturing companies based in Paterson, NJ. “Paterson Eco-Chic is meant to bring awareness to not only the silk and textile industry’s rich history in Paterson, but also to the undeniable need for sustainable practice in fashion,” said Cristina Deutsch, Paterson Eco-Chic Project Director & Curator at the Paterson Museum. 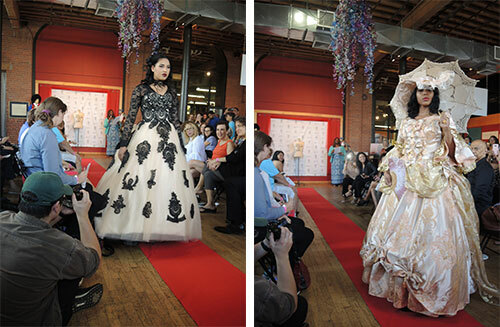 As part of the opening reception for Paterson Eco-Chic, the Berkeley College Fashion Club orchestrated a fashion show that presented a historical overview of fashion style in Paterson, displaying garments that ranged from the Victorian era to the 1960s. Photo Caption B: Garments made by acclaimed theater designer Victoria Pero with environmentally sustainable materials are on display at the Paterson Museum as part of its eco-friendly fashion art installation, Paterson Eco-Chic, which launched during an opening reception on September 17, 2017. “Our objective was to create a fashion show that enhanced consciousness within the community about the role Paterson and sustainability have played in fashion,” said Palenia Pichardo of Paterson, President of the Berkeley College Fashion Club in Woodland Park. While the Club is comprised of students from all majors, many of its members are enrolled in the Berkeley College Fashion Merchandising and Management program, which integrates the creative and business aspects of the fashion industry with current technologies, covering the complete fashion global supply chain. “The experience of developing this show gave Berkeley College students, who are cultivating a business intellect along with a sense of style, a chance to apply what they are learning in class into practice,” said Professor William Filerino, PhD, Fashion Merchandising and Management, Berkeley College Larry L. Luing School of Business®. Curated by Ms. Deutsch, Paterson Eco-Chic is made possible in part from a grant administered by the Passaic County Cultural & Heritage Council with funds provided by the New Jersey State Council on the Arts. The garments displayed in the exhibit were created by local artists, students from the Bergen County Academies, and acclaimed theater designers like Victoria Pero. Recyclable materials used to make the pieces were donated by Les Metalliers Champenois, Accurate Box, Greenbaum Interiors, Feldman Brothers, and more. Click here to view more pictures from the opening reception Paterson Eco-Chic at the Paterson Museum. Photo Caption C: On the left, Cristina Deutsch, Paterson Eco-Chic Project Director & Curator at the Paterson Museum (far left), and Palenia Pichardo of Paterson, NJ, President of the Berkeley College Fashion Club in Woodland Park (fifth from the left), pose with models who presented a historical overview of style at the Paterson Museum’s eco-friendly fashion art installation, Paterson Eco-Chic, on September 17, 2017, during a fashion show orchestrated by the Berkeley College Fashion Club of Berkeley College in Woodland Park, NJ. On the right, Professor William Filerino, PhD, Fashion Merchandising and Management, Berkeley College Larry L. Luing School of Business®, poses with a model from the fashion show.